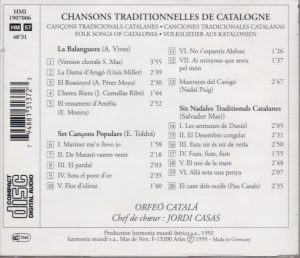 Recorded 1 & 2 May 1992, in the Sala del Forn (furnace room) of the Poblet Monastery. I’m somewhat disappointed with this recording. I expected something a little more sophisticated. These are, for the most, simple harmonizations of simple folksongs, that stand out neither melodically nor harmonically, suitable I’m sure for amateur choral societies but not very nourishing for the listener. Exceptions are provided by a few of the Toldrá harmonizations, but even they don’t really leave a deep imprint. 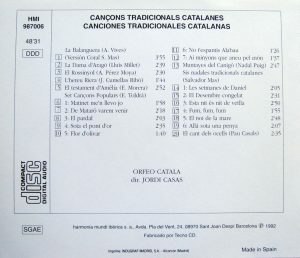 A curiosity is provided by the harmonization of El cant dels ocells (The Song of the Birds), made famous by Pablo Casals, who used to play his arrangement for cello and piano at the begining of each of his concerts after his exile from Spain (can be heard here), after which the song became the unofficial Catalan anthem. 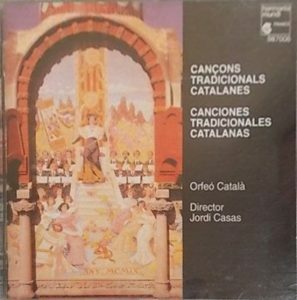 And, so, it appears that Casals also did an arrangement for soprano and chorus. 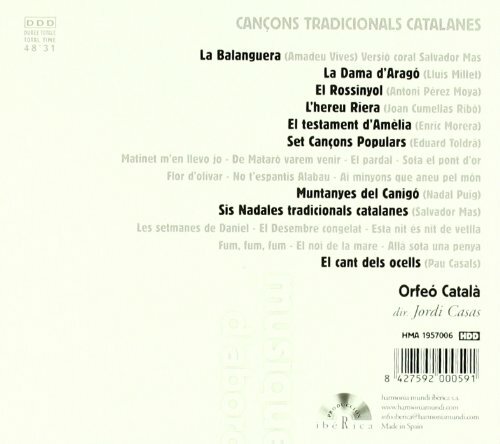 Well, okay, deeply nostalgic – I’d have thought it was Russian (without the deep bassos) if I didn’t know it was Catalan. That nostalgic mood in itself is a bit surprising, given that it’s supposed to be a Christmas carol in which the birds celebrate the birth of Jesus… I guess it’s a case where context (exile) overshadowed content. Still, if you came here looking for something as pretty and seductive as Canteloube’s Chants d’Auvergne, I’m afraid you’ll be disappointed. 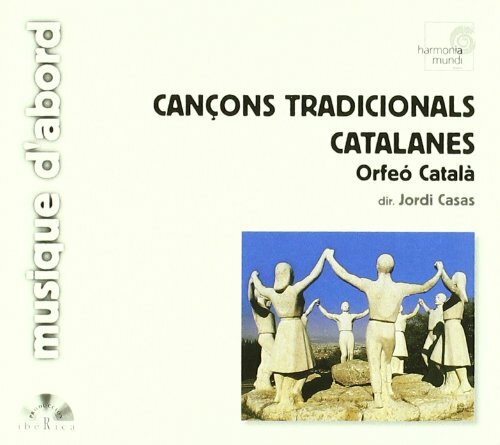 Fans of Christmas Carols and Catalan nationalists might find more appeal to this than I did. I have the first reisse on Harmonia Mundi Musique d’abord HMI 1907006, texts of songs provided but no translations. TT is 49 minutes, which in other circumstances I’d have found stingy, but here I’m not asking for more. Orfeó Catalá is an amateur choral society founded as far back as 1891 by two of the composers/harmonizers featured here, Lluis Millet and Amadeo Vives, see entry on Wikipedia.